Flank Steak has become a very trendy cut of meat. I remember when flank steak was one of the cheapest cuts of meat used mainly to make fajitas and stir fries. Well all that’s changed, this cut of meat is very much in demand and now picarries a pretty hefty price tag. I’m not really sure why it got so expensive because it’s not exactly the most tender cut of meat; in fact unless it’s prepared correctly flank steak is down right tough! My best guess would be it got pricey because fajitas have gotten really popular and folks have found other uses for this grainy cut of thin meat. Anyway I love cooking with flank steak. It makes great fajitas and stir fries, and it’s thinness makes it ideal for stuffing or rolling. My grandma used this cut to make her famous Morcon, marinated flank steak that’s rolled around a hot dog, carrot, pickle, and hard boiled egg. She always made it for special occasions like birthdays and Christmas. 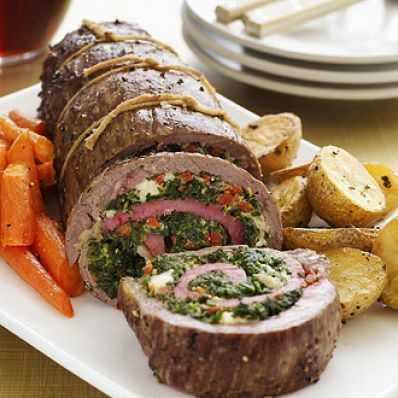 Aside from making fajitas, carne asadas, beef broccoli, and Filipino bistek, I make this awesome stuffed flank steak. It’s super easy to make, needs only 4 ingredients, and bakes in the oven in less than an hour. The best part is it looks so pretty that it’s bound to impress everyone, so yes you can serve it to company! The hardest part of this recipe is butterflying your flank steak. That’s cutting in horizontally to make it thinner. When you butterfly your steak be sure you don’t cut all the way thru, you want both pieces to be attached by a thin strip in the back. Here’s my recipe hope you enjoy it as much as we do! For more easy Beef recipe Click Here!